I was travelling on Singapore Airlines new business class from Singapore to San Francisco (via ICN). 136,000 Kris flyer miles spent + tax of $431.90, both ways from SIN-SFO-SIN. That was a super saver ticket so it really depends on your luck because not all flights have this package available. It can be either on the waitlist, or you might want to get another more expansive ticket available. Anyway, it was a good deal and here are some of the highlights. SQ has collaborated with BMW Group Designworks USA, James Park Associates and Massive Interactive to develop the new Business seats and its in-flight entertainment system. Comparing to the old business class seat, the new one is slightly smaller but still, consider very wide across industry standard. Plenty of buttons for your many patterns of sitting position! There is a touchscreen controller to navigate the screen instead. Welcome drinks before takeoff: We had a choice of either Champagne, juice or welcome drink. Another round of drink service after take off. SQ is very generous in offering drinks throughout the flight. Chicken and beef satay was served as canapés after take off with a drink. 2nd course: Classic Lobster Thermidor Lobster tail sautéed in butter, flambéed in brandy, sprinkled with cheese, and served with creamy mushroom sauce, garlic and spicy mustard, and buttered asparagus. That was really delicious. This dish was NOT in the onboard menu. I pre-booked the main course while booking the flight through SQ website. SQ has a “Book-the-cook” service where passengers in premium economy, business and first class can choose from a wide selection of meals up to 24 hours before the flight. I love this because you’ll never have to worry if they run out of choice by the time taking your order (if you are not their PPS member). Cruel huh.? Wine: Napa Chardonnay from Starmont winery. I actually love SQ business class menu as they offer a great selection of wines, coffee and tea. Apart from the normal Cappuccino, Espresso, Mocha… they also offer single-origin coffee from Guatemala, Brazil and Ethiopia. If you are a coffee lover, you might want to do a coffee tasting instead of wine tasting onboard. Just order them black. SQ selections of tea from TWG TEA, love the variety. My favourite was Darjeeling. Comparing to other airlines, the amenities given on Singapore Airlines Business Class is quite limited. There were NO individual amenities pouch or pyjamas given, instead, they provided only in-flight slipper, a pair of socks, and eyeshades. I would prefer to have a small goodie bag that includes everything essential such as toothbrush, pen, combs etc in a pouch though. Seats – 4.5/5– very spacious and lay flatbed is always good for long flight. Entertainment system – 4/5 – Just the fact that it’s still not using touchscreen TV.. WHY? Amenities – 3/5 – as mentioned, it can be quite limited. Food – 5/5 – lots of selections of food and drinks. I’ve definitely put on weight after the flight. Singapore Airlines business class is definitely one of the most expensive business class product among the other elite airlines. Amenities and hardware might not be the best but the service and food selections are still at the top end side. 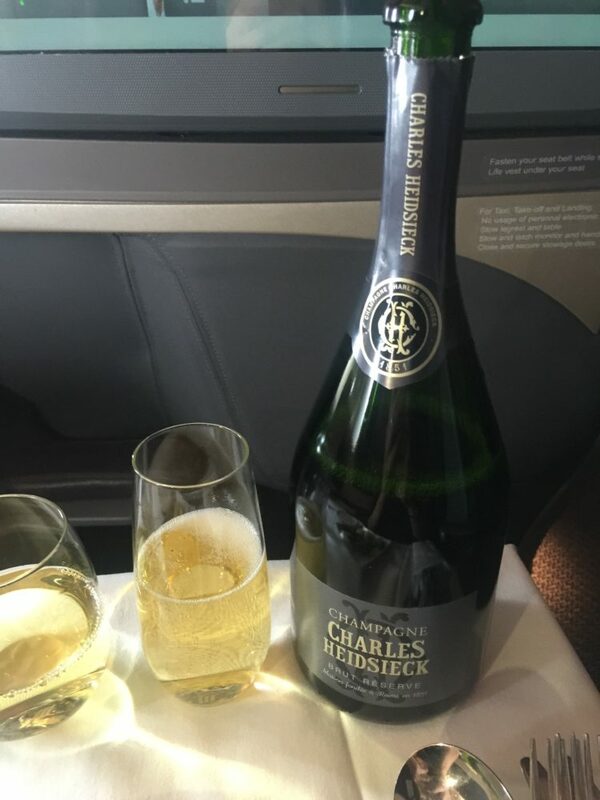 If money is not an issue, this is definitely the go-to airline for business class or first class!